Santa�s Summer Ride - 2 Reindeer Power. Mele Kalikimaka is Merry Christmas in Hawaiian. Pacific Legend shirt is Available in Black and White. 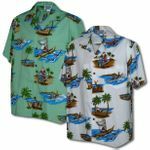 Shirt images are engineered to match up on the shirt panels at the button line and the pocket.